I can’t complain about my life. I have a great deal to celebrate and even more for which to be thankful. 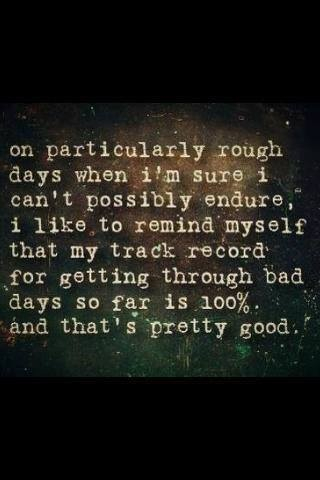 But that doesn’t mean I haven’t faced tough days and difficult times. There have been times when I’ve spent days in tears and weeks worrying whether life will get any better. Logically, I knew things would get better. But emotionally, I sometimes felt as though they wouldn’t. They always did, of course, and I came out of the situations stronger and wiser. Which is why, when someone posted a quote on Facebook the other day, I completely appreciated it. It simply made me smile. Posted on January 25, 2014, in Family, My life, perspective and tagged 365 reasons to smile, books, life, musings, resiliency, smiles, Thoughts. Bookmark the permalink. 20 Comments.